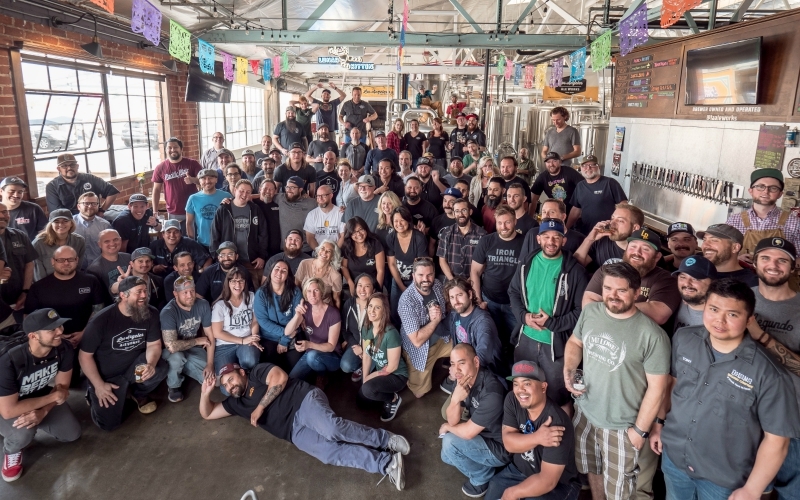 At L.A. Beer Week‘s big Kickoff event on June 16, the entirety of the Los Angeles brewing scene will come together to celebrate its growing industry. For beer enthusiasts, there’s no better opportunity to taste offerings from all those far-flung breweries and brand new operations they’ve been meaning to hit up but haven’t gotten around to yet. Sixty five L.A. County breweries will pour samples at the Kickoff, including eight operations that have opened since the last L.A. Beer Week, and a couple more that are new to the L.A. Brewers Guild and will be attending the Kickoff for the first time. Another 20 guest breweries from around the country, selected for their support of the L.A. scene over the years, will also attend. If you’re a local craft-beer lover, you’re probably familiar with most of the scene’s big names like Beachwood Brewing, Monkish Brewing Co., and El Segundo Brewing Company. But with nearly 80 breweries now operating in L.A. County, it’s all too easy to miss some of the new gems and low-key hotspots that have opened more recently. Here’s a breakdown of the 10 newcomers that should be on your Beer Week radar (plus some specific beers you won’t want to miss). The biggest opening since last Beer Week cropped up in suddenly hot Hawthorne, which is also home to Los Angeles Ale Works’ tasting room and brand new Ximix Craft Exploration Company. Common Space Brewery has big ambitions and the early buzz to back it up. The approachable and refreshing lagers have been early hits, with variations on German classics and more Americanized takes as well. Their Jasmine Rice Saison really stands out as a summer-style beer to sip this season. In 2015, Five Threads opened on the border of L.A. County in Westlake Village, what owner and brewer Tim Kazules calls the “L.A. beer frontier.” The brewery joined the L.A. Country Brewers Guild in 2017, and Kazules is excited to show off his brews to all the beer-lovers at the Kickoff. Look for their flagship Gameday Blonde, a light and crisp ale that’s dry hopped with the floral Liberty hops, and a special variation on Serenity, a Belgian golden ale that’s been aged in white wine barrels for six months. Liberation is part of the latest wave in new breweries to open in Long Beach, but the operation was in the works for awhile. Musician and beer-lover Dan Regan of ska-revival band Reel Big Fish is behind the venture, which is turning out a slew of classic craft styles. The Kickoff will be the brewery’s first opportunity to make a splash in the larger community. Look for their IPA made with the tropical Galaxy hops for a modern take on a classic Cali IPA. They’ll be showcasing a range of flavors at the Kickoff, from the approachable to the inventive. There’s bound to be something you’ve never tasted before. The newest of the new breweries in Los Angeles, Ogopogo (the palindromic name references a Nessy-like Canadian lake monster) just opened its doors this month. At the moment, the San Gabriel brewery is only open on Sundays as the final red tape hurdles are cleared. Besides a few events in San Gabriel and a few bars around L.A., the Kickoff will be Ogopogo’s debut to a larger L.A. audience. The industry vets behind the brewery are champing at the bit to get their brews into the hands of L.A. beer fans. Look for their rye pale ale and traditional porter at the fest. Old Stump Brewing Brewing Co.
Old Stump Brewing has been operating in North Pomona since 2015, but the brewery didn’t join the L.A. County Brewers Guild until 2017, and this year’s Kickoff Festival will be its second guild event (they also poured at the L.A. Beer and Food Festival back in January). The brewery likes to experiment within the popular blonde ale family, often adding a little something extra to the batches, like jalapeño or passionfruit. The grapefruit-tinged Red Hammock is a local favorite. The first brewery to open in Signal Hill since it was incorporated in 1924, Ten Mile Brewing joined the blossoming Long Beach beer scene in late 2017 with a lineup of traditional styles. From German lagers to British ales and even an American style nearly forgotten to history, founder Dan Sundstrom says the beers are more about perfecting what’s in the box than thinking outside of it. Hidden Hollow is the aforementioned historical style, a Kentucky Common, one of America’s oldest indigenous beer styles. The mahogany-hued brew should stand out among the many blonde ales and IPAs being poured at the festival. The newest addition to the breweries thriving in and around downtown L.A., Wiretap Brewing opened in Lincoln Heights, just across the river from all those new drinking and dining destinations in Chinatown. The dual focus at Wiretap is on perfecting styles the founders fell for on their travels (namely the kolsch and altbier from Germany) and exploring new hybrid styles, as with their flagship Luchador ale. They call it a Mexican Strong Ale, and the brew mixes the dark lagers of Mexico with the flavors of Belgian beers. Opened in Gardena in April 2018, Ximix (pronounced “zim-ix”) is exploring a galaxy of different styles and brewing techniques from hoppy IPAs to summer-friendly stouts and some Belgian inspired ales. Brewer Erik DeBellis says he likes to brew by the seat of his pants as inspiration strikes him, and he isn’t yet sure what beer he’ll bring to the festival, but he’s excited to show off his brand to the assembled scene at the Kickoff. Torrance has been a bright spot on the L.A. beer map pretty much since the beginning of beer in L.A. Longtime brewpub Red Car Brewery and local stalwart Strand Brewing have been joined more recently by fan favorites such as Monkish and Smog City. But Zymurgy Brew Works does things a little differently. The nano-brewery offers would-be brewers the opportunity to make their beer dreams come true with DIY brewing sessions, no experience necessary. The focus is on education and experimentation, and the crew also cooks up a rotating list of house beers. Expect a single-hop pale ale featuring Mosaic hops at the festival. Cellador Ales: This ambitious operation based out of North Hills has built a cult following with its intense and layered wild ales. If you like sour beer, Cellador’s Clockworks should be on the top of your must-try list; it’s a blend of wild saisons conditioned with Valencia orange zest and cardamom. Craftsman Brewing: Part of the old guard of the L.A. beer scene, this 20-year-old Pasadena brewery makes the superlative 1903 Lager that’s the perfect balance of drinkable and characterful, but it’s mastermind Mark Jilg’s wood-aged brews that really wow. Cellarmaker Brewing Co: San Francisco’s favorite maker of hoppy treats (and more adventurous brews) is just one of the exciting guest breweries pouring at the Kickoff. You don’t often get the chance to try Cellarmaker’s beer in SoCal, and whatever the bring down with them is sure to be a hit. Unity—The Official Beer of L.A. Beer Week 10: Each year the collected L.A. breweries come together to collaborate on Unity—the official beer of L.A. Beer Week. It’s a different style brewed at a different brewery every year, but for 2018 things went down a little differently. Highlighting the schism in craft beer’s favorite style, the brewers at Los Angeles Ale Works made two versions of IPA (with the help of a hundred of their closes beer industry buddies): one dry, bitter, and classically West Coast styled; the other hazy, soft, and juicy. You can try both versions at the special Unity booth at the festival, along with some further adulterated variations. Maybe L.A. Ale Works will even bring their infamous beer slushie machine to help you cool off under the June sun.